Nerja is a very popular summer resort located in the eastern tip of the Costa del Sol. Once a small sleepy fishing village, Nerja has become probably the best place for beach holidays in Andalucia. Nerja boasts unique coastal landscape which you won’t find anywhere else on Costa del Sol. Surrounded by cliffs, Nerja’s extensive beaches are famous for crystal clear water and charming coves that lure all beach-goers to take advantage of the warm sea. 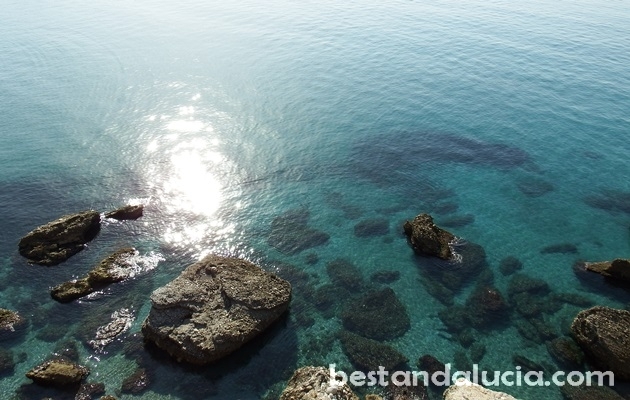 Nerja’s coast is probably the best place for scubadiving and snorkelling on Costa del Sol. However, if your kids enjoy building sand castles, they might be disappointed as the sand tends to be coarse and mixed with small pebbles. The Caves of Nerja, part of Andalusian Geological Heritage, is the most popular attraction of Nerja, although located on the outskirts of the town. 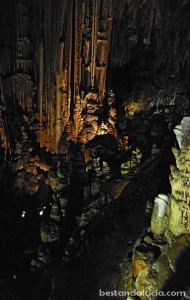 A long walk up and down the winding stairs allows a visitor to explore a series of overwhelmingly colossal caverns, home to the world’s largest stalagmite measuring an incredible 32 metes. Nerja is a perfect place those seeking to spend their holidays actively with their family. If you are into kayaking, water-volleyball, swimming, scuba diving, paddling or rowing boats, Nerja is the best place in Andalucia for your next summer holidays. The closest airport is in Malaga. Getting from the Malaga airport to Nerja takes about an hour. Calahonda beach – located on the eastern side of Balcon Europa. It’s the most photographed beach in Nerja. Small beach surrounded by cliffs and rocks with a small fishing cabin in the corner. It boasts crystal clear water, but can be overcrowded in high season. The popular El Papagayo restaurant is located directly on the beach. La Caletilla beach – located on the western side of Balcon Europa, just under the hotel Balcon de Europa. Only 50 metre long. Sunbeds for hire are available here. 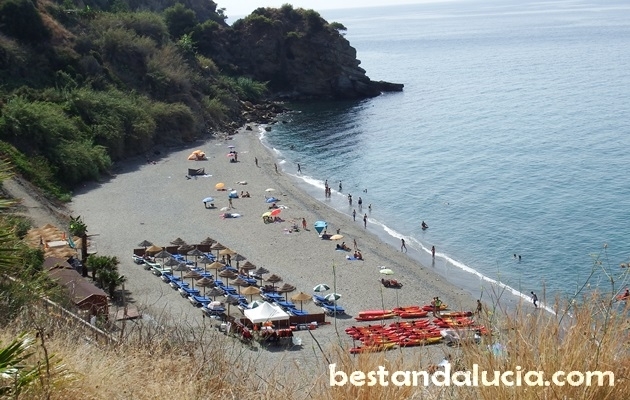 Buriana beach – the biggest and most know beach in Nerja with distinctive local fishing boats in the western side of the beach. It’s nearly 1 kilometre long and 40 metre wide. There is a mix of small stones and sand on the beach. On Buriana you will find here showers, volleyball nets as well as sunbeds, kayaks or even jetskis for hire. Long paseo marítimo runs behind the beach with some good restaurants offering amazing paellas in the shade. 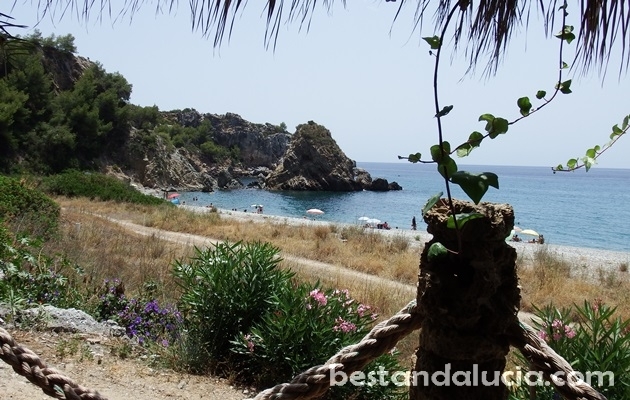 Maro beach – 500 metre long and 20 metre wide beach located in the Maro village, just next to Nerja. Favourite spot for many scubadivers, because of vivid and abundant sea life. One of the favourite activities on the beach is canoeing. The sea route between Maro and Buriana beach is breath-taking. There are plenty of beautiful waterfalls and small coves on the way, the water is shallow and it’s possible to see the bottom of the sea from your kayak. 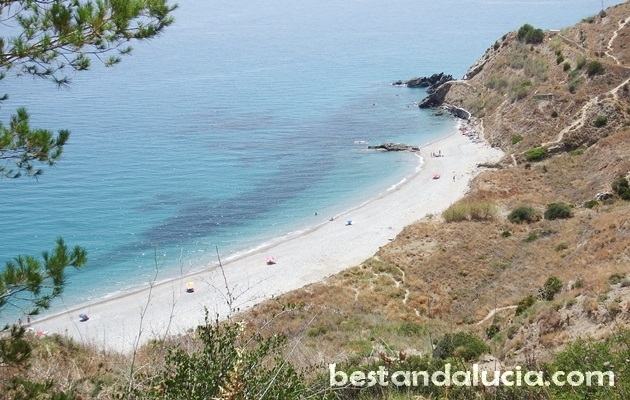 Canuelo beach – one of the most beautiful beaches in Spain, around 13 kilometres from Nerja. It’s wild, full of beautiful rock formations and transparent shallow water teeming with little fishes. All this makes it a great snorkelling beach for everyone. There is a very nice restaurant at the beach as well. The Canuelo beach is located in the protected area which makes it impossible to access the beach by car. At the parking near the N-340 road, at the roundabout, catch a shuttle bus which goes to the beach every 15 minutes in season. 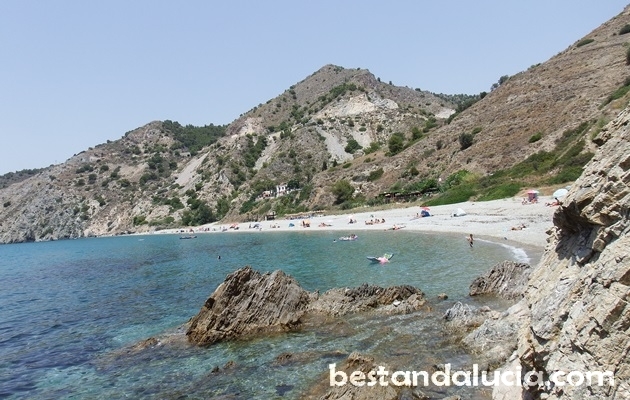 Las Calas del Pino beach – 350 metre long peaceful beach located a couple of kilometres east of Nerja, in the Park Natural Acantilados de Maro-Cerro Gordo. A steep 200 metre long walk leads to the bottom of the beach. Because of the troublesome access, there is not many people on the beach which adds to the a blissful feeling of remoteness. The beach tends to attract some nudists. Alberquillas beach – 500 metre long beautiful rural idyllic beach. 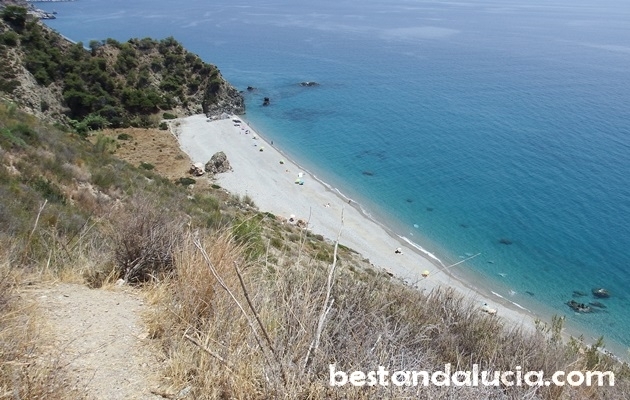 It’s located 10 kms east of Nerja, in the Park Natural Acantilados de Maro-Cerro Gordo. The water is amazingly clean on the Alberquillas beach, it abounds in fishes and snorkelling there is truly unforgettable experience. The beach is quite popular among nudists. To get there you need to park your car near the N-340 road and walk down a steep chill. 8. 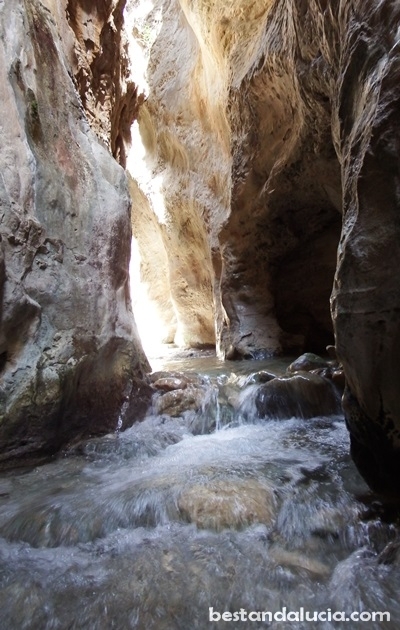 Rio Chillar walk -if you seek to really cool off on hot summer day in Nerja, try the fantastic walk down the Rio Chillar, and take all your friends and family with you. You will all love it! When you start the walk, the water will be ankle height, but further up the river in the narrow shady canyon it can be knee-height. The whole route is 17 km long, but most people do around 10 kms. ‘Rio Chillout’ can be a great alternative to beaches when it’s too hot for a beach. Find all the practical information, helpful tips and opinions on holidays in Nerja, Spain. Check out Nerja’s top attractions, recommended places to stay and best things to do. Read about the best restaurants in Nerja, Andalucia. Plan and book your vacations today with our website. Nerja is a top place for active family holidays. Find and book top hotels in Nerja, Spain. Check hotels in Nerja in Andalusian Costa Tropical which offer good value for money. Pick the hotel that best suits you and your budget. Find and rent apartments, houses and villas for summer holidays in Nerja, Spain. Choose from the best variety of properties. Luxury holiday homes with private pools, tennis courts and more. Enjoy great holidays in Nerja, Andalusia.